Now that we're in June, I can finally say that I'm going on holiday this month so although we booked it in early March, it actually feels more real now that it is only a few weeks away. I am really looking forward to it because the sun/heat always helps my bone pain. Today I am sharing the products I use to prep for a sun holiday and also the products that I consider essentials when I'm away. All of the these products are available at discounted prices from Fragrance Direct and all are linked if you want to buy any of them yourself! I'm not a believer is punishing yourself with strict diets before holiday so I won't be mentioning anything like that but I do begin my preparation a few weeks before I go away so that my skin is soft and smooth. I suffer a lot with water retention so I love to use Clarins Contour Body Treatment Oil, which really helps to flush out excess fluid in my legs, arms and stomach. I use this for several weeks before going on holiday but I also bring it with me because I find that both flying and heat make my water retention worse but this really combats that. I apply the oil to damp skin, starting at the ankles and working upwards in firm, circular motions. The instructions say to follow with a cool shower, which I sometimes do but not always - either way, this works so it is a holiday essential for me. I highly recommend it to anyone who suffers from water retention. Currently reduced from £40 to £34.55. A body scrub is an essential all year round but particularly when prepping for holiday because when my skin is soft and smooth, products apply more evenly and I tan more evenly. I love this Decléor Cream Exfoliating Fresh Skin Body Cream because the creamy texture means that it is gentle on my skin yet it also really exfoliates the dead layers of skin, leaving my skin very soft and smooth without tearing the skin or leaving it red. Because it is creamy in texture, it spreads easily and a little goes a long way. The combination of this scrub and oil has my skin ready for exposure! Currently reduced from £31.30 to £11.75. I use a foot cream all year round but especially on holiday to make sure my feet are soft and smooth because I'll obviously be wearing flip flops and sandals every day and night! This Elemis Treat Your Feet Foot Cream is definitely a treat, as the name suggests, because it is formulated with shea butter and jojoba oil to moisturise the skin but it is also formulated with eucalyptus and lemon oil, which help to soothe the skin. Currently reduced from £18 to £13.99. A hand cream is also an essential - obviously I use SPF on my hands daily but at night I like to lash on lots of hand cream to keep my skin soft and supple. Anything that contains shea butter is right up my street as I find it so moisturising and this Heathcote & Ivory Shea Butter Hand Cream is rich, yet absorbs quickly and it smells beautiful due to the inclusion of Jasmine and Lemon Oil. Currently reduced from £10 to £8.99. Obviously SPF is an essential and because I have sensitive skin, there are only certain brands that I can use - one of them is Ambre Solaire, which I have used since my mother used to slather me in it as a child. I love to use both creams and oils and find mists particularly useful on holiday - especially the new anti-sand variety. These sun creams are 2 for £12 at the moment. Also included in that offer are aftersuns and this soothing option contains aloe vera, perfect for healing and soothing the skin after sun exposure as well as moisturising the skin, which in turn prolongs my tan. Finally, haircare essentials! This mini pot of Kérastase Chrome Captive Hair Mask is perfect for bringing on holiday because it's tiny, so won't take up too much room in my wash bag, but contains enough for a few treatments. I always need a mask to inject some moisture back into my hair when I am spending my days in the sun! Currently reduced from £13.95 to £11.95. After washing my hair, I always use a detangling spray and this Uniq One All in One Hair Treatment is brilliant because it adds moisture, helps to detangle, repairs and protects against UV damage. It also smells of coconut, which is one of the scents that always makes me think of sun holidays! Reduced from £13.99 to £9.50. All of these products are available from Fragrance Direct, which is a one stop shop for every beauty need and they offer free delivery on orders over £20! 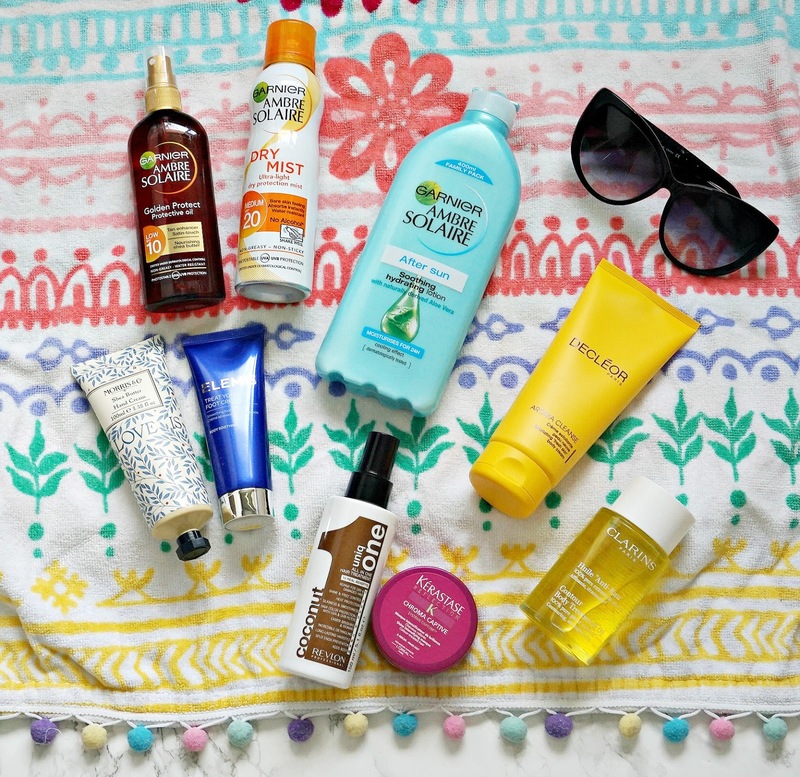 What are your sun holiday essentials? Are you going away this summer? I would love to hear in the comments below! All products are bought by me, unless otherwise stated. This post is not sponsored but all of the products were sent to me from Fragrance Direct. Opinion is always my own.